All eyes on the Olympics, but what to watch? 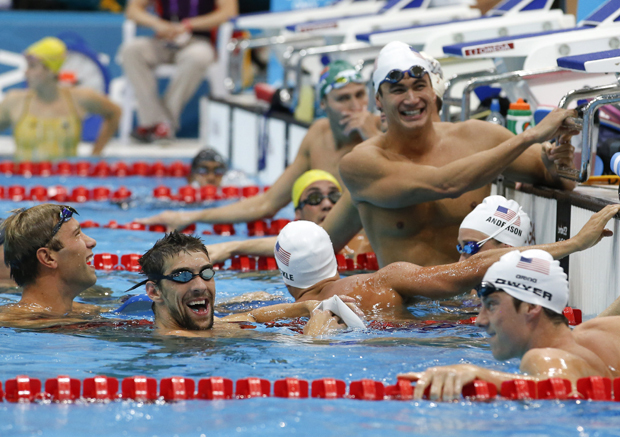 Michael Phelps, second from left, shares a laugh with other U.S. swimming team members during a training session at the Aquatics Center at the Olympic Park Monday. 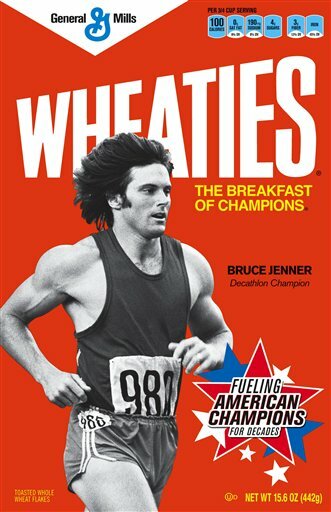 Former Olympian Bruce Jenner graces the cover of this retro Wheaties box. The Summer Olympics has always been a “must-watch” TV event – now it’s a “must watch” event online and on Twitter, too. If you have more than 3,000 hours to spare in the next two weeks or so, there will be plenty of sports to choose from – but it may be a challenge to figure out what events are playing when and how to prioritize. Here are some suggestions. NBC will dictate what they want to highlight, of course, and most likely it will be highly decorated swimmer Michael Phelps. He’s won 16 Olympic medals – 14 gold – and rightly he should be spotlighted. Phelps has an opportunity to smash the record for most medals won by an Olympian, plus this is his final games. Who doesn’t love watching someone make history? Phelps’ success is reminiscent of another great U.S. swimmer; Mark Spitz had an amazing Olympics in 1972 in Munich, winning seven gold medals. His poster – posing in American flag swim trunks, gold medals and trademark mustache – was on many a teenage girl’s wall. (Yes, I had one.) Unfortunately his terrific performance was overshadowed by the massacre of 11 Israeli coaches and athletes by Palestinian terrorists. Spitz’s accomplishments were seemingly re-discovered during the 2008 Beijing Games as Phelps set swimming records; much has changed in 40 years, but athleticism still rules the Olympic Games. Another American swimmer to watch is Ryan Lochte; he may have some keen battles with Phelps in the 200 and 400 individual medleys. Keep an eye on 17-year-old Missy Franklin, too. She’ll be the first woman to compete in seven events and is expected to have a breakout performance. Phelps has called her a “stud”. . .I guess that would be a compliment? It has been a difficult emotional time for Missy; she is a high school student from Aurora, Colo.
Who will be the next Shawn Johnson, Mary Lou Retton, Bart Connors or Paul Hamm? Gymnastics is always at the top of the list for many Olympics viewers. In ’08 host country China won gold for both teams; the U.S. men took team bronze and women won the silver. This summer the U.S. men’s Olympic team has one “old guy” – 26-year-old Jonathan Horton, who will anchor the team with Danell Leyva and John Orozco. The women have the 2011 individual world champion Jordyn Wieber and the top Olympic qualifier Gabby Johnson to lead. Look for one of these athletes on a Wheaties box near you if they become the darling of the games. The U.S. men’s team did not qualify for the Olympics – but the U.S. women’s team did. Hope Solo and the rest of the team are still smarting from their World Cup loss to Japan last year on penalty kicks. That would make for a fantastic gold medal match-up. This sport is the newest entry for women these Olympics. Some of America’s greatest male boxers have gone on to Olympic glory: Cassius Clay (Muhammad Ali), Sugar Ray Leonard and Evander Holyfield. This time around there are no American men favored in any of the weight classes, but there are three women’s weight classes and the U.S. has a top competitor in the middle weight division – Claressa Shields with a 26 and 1 record. Boxing may not be everyone’s cup of tea but this one piques my interest. There is nothing like being in the Olympic stadium for track and field, when there is more than one event happening. You see some incredible competition and a split second determines a medal. It’s always a must in my book. In ’96 in Atlanta it was terrific being in the stands as Michael Johnson blazed first across the finish line in both the 200 and 400 meter final with his gold shoes. Like 2008, Jamaica’s Usain Bolt is still a track star to watch; but countryman Yohan Blake beat Bolt in the time trials. Their showdown could be one of the biggest Olympics highlights. American Allyson Felix is a favorite in both the 100 and 200 meters race, but she almost didn’t make the team for the 100 meter race. In the qualifying trials, Felix crossed the finish line with her training partner, Jeneba Tarmoh, in a dead heat for the final spot. They were going to have a run–off but Tarmoh decided to back out. Strange-but-true track and field trivia tidbit: You may know Bruce Jenner as Kim Kardashian’s step-father, but his real claim to fame came in 1976. He became a star in the Montreal Olympics when he won the gold medal in the decathlon. It is one of the most grueling events, and at the time when Jenner won, the most prestigious. Aston Eaton broke the world record at the U.S. trials this year and he is the favorite in London. What else to catch? Fencing, biking, equestrian, diving, field hockey, water polo, volleyball, wrestling? Weight lifting, judo, taekwondo, basketball (although as I wrote in a prior blog – not a fan of the men’s)? Canoeing or rowing? They’re all events that you may find interesting. So many sports, not enough time in the day. I have crossed off synchronized swimming and rhythmic gymnastics, so that should give me an hour of sleep the next few weeks.